The Hako Citymaster 1200 is the most powerful vacuum sweeper in its class for professional street and footpath cleaning. It suits a wide range of applications. Tailor-made to meet the requirements of the most demanding applications it has numerous possibilities of expanding its functionality. It is the unit of choice by councils and municipal cleaning companies around the world. 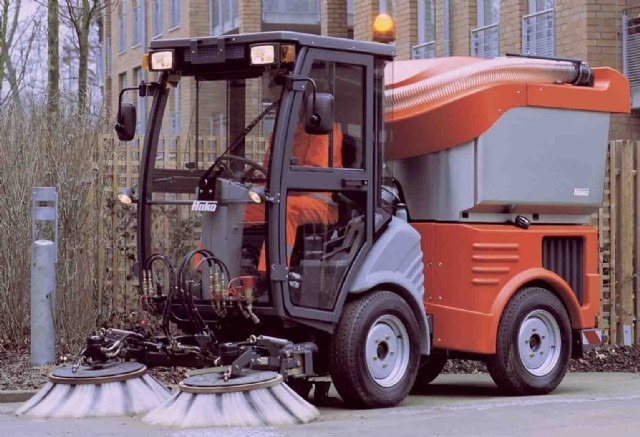 The Hako-Citymaster 1200 does not only leave a clean impression in urban areas but also ensures tidy figures in the balance sheet. In conjunction with a perfectly fitting range of accessories, the vehicle can cope with the work at hand quickly, comfortably and ecologically. It is operated intuitively without presenting the driver with a series of puzzles. This means that safe operation of the Hako-Citymaster can be learned quickly and drivers can concentrate on what’s important – trouble-free completion of their work. The Hako-Citymaster 1200 is the ideal solution for the most diverse usage in confined spaces. The chassis with articulated joint and integrated floating axle compensation keeps the vehicle on track to ensure safe driving in all situations even with heavy loads and also provides high levels of manoeuvrability and flexibility of use both on curbs and on open terrain. The powerful drive can be optionally supplemented by all-wheel drive and differential lock. Operation of the Hako-Citymaster 1200 is particularly easy. The driver has an excellent view of the work area and can concentrate fully on the job assigned. The efficient heating system and optional air-con unit together with the standard comfortable seat and low noise level provide high levels of comfort in all seasons. Two quality doors enable entry and exit on both sides, the integrated sliding windows enable individual ventilation. The heart of the Hako-Citymaster 1200 is the environmentally friendly, powerful diesel engine with direct injection. Low consumption and emission values (97/68/ EU Stage IIIa) and the low-noise cooling air feed means it is also perfect for use in city centres and pedestrian precincts. The easy-to-connect and efficient hydraulic system assumes the noise-damped drive of attachment devices and accessories.